A number of recent studies indicate that the number of people over the age of 60 who are drinking in excess is growing, and growing rapidly. This is an alarming trend; people over 60 years of age are especially vulnerable to the bad health impacts of alcohol, like compromised immune systems, memory loss, reduced liver function and more. There are a number of reasons that seniors are drinking in increasing amounts, though the precise cause of excessive drinking is always personal. A lack of affordable and accessible healthcare is causing some seniors to self-medicate using alcohol; loneliness and changes in daily living routines is also causing some older Americans to consume more liquor. Lack of control over how much you drink: If you frequently find yourself thinking that you’ll have a single drink, and then drinking to excess, you may have a substance abuse problem. It’s common for alcoholics to rationalize their drinking by telling themselves that they’ll have a single drink, and then consuming a number of beverages. Inability to control when you drink: Drinking during the daytime, particularly in the morning, is often a sign of substance abuse. Because many seniors are retired, it becomes easier to drink throughout the day without worrying about ramifications at work. If you find yourself or your loved one drinking at earlier times throughout the day, it could be indicative of an alcohol problem, particularly if it occurs on a regular basis. Feeling a compulsion to drink: People suffering from addiction feel an uncontrollable compulsion to consume alcohol. If you find yourself feeling like you need to drink on a regular basis, it’s often a sign that you’re suffering from an addiction. Additionally, if you’ve reached a point where you feel like you need to have alcohol to feel like yourself, it’s probably time to start considering your treatment options. Having alcohol tolerance: Many alcoholics need to consume more and more alcohol to achieve the same psychological state. If you’ve built up a tolerance to alcohol where you feel the need to drink increasing amounts of liquor in order to get drunk, it could be a sign that you’re suffering from alcohol abuse. Experiencing blackouts: Advanced stages of alcoholism often include substantial memory loss, which is particularly damaging for senior citizens. Many alcoholics are unable to recall daily activities, and experience regular memory blackouts. If you’re regularly losing sections of your daily life, it may be a result of excessive alcohol consumption. 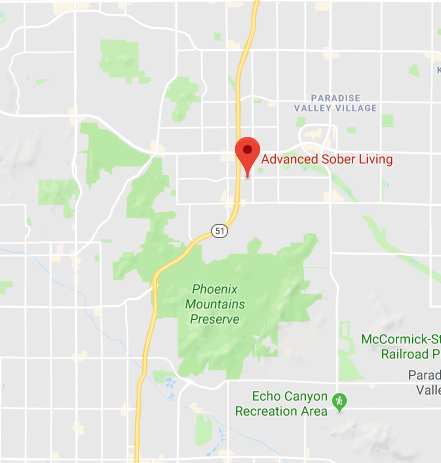 Advanced Sober Living is an alcohol recovery center in Phoenix, AZ helping men of all ages move toward alcohol recovery. Reach out today to learn more about how we can help.